Fits 03 - 12 Toyota. 4.0L 3956cc DOHC V6 (24 Valve), "1GR-FE". Brand New Timing Chain Kit + Water Pump with Metal Gasket. 03 - 09 TOYOTA 4RUNNER 4.0L 3956CC 241CU. V6 DOHC, ENG CODE "1GR-FE". 07 - 09 TOYOTA FJ CRUISER 4.0L 3956CC 241CU. 05 - 12 TOYOTA TACOMA 4.0L 3956CC 241CU. 05 - 10 TOYOTA TUNDRA 4.0L 3956CC 241CU. 3 Timing Chains (1 Lower, 2 Upper). 3 Timing Chain Tensioners (1 Lower, 2 Upper). 4 Timing Chain Guides Rails. 4 Timing Chain Sprockets (2 Secondary Exhaust, 1 Crank, 1 Idler). 1 Water Pump Gasket (Metal). We will do everything we can in order to build your trust and business. PART NUMBER: TK2030WP Fits 03 - 12 Toyota 4.0L 3956cc DOHC V6 (24 Valve), "1GR-FE" Brand New Timing Chain Kit + Water Pump with Metal Gasket Application 03 - 09 TOYOTA 4RUNNER 4.0L 3956CC 241CU. V6 DOHC, ENG CODE "1GR-FE" 07 - 09 TOYOTA FJ CRUISER 4.0L 3956CC 241CU. V6 DOHC, ENG CODE "1GR-FE" 05 - 12 TOYOTA TACOMA 4.0L 3956CC 241CU. V6 DOHC, ENG CODE "1GR-FE" 05 - 10 TOYOTA TUNDRA 4.0L 3956CC 241CU. V6 DOHC, ENG CODE "1GR-FE" Package includes ---3 Timing Chains (1 Lower, 2 Upper) ---3 Timing Chain Tensioners (1 Lower, 2 Upper) ---4 Timing Chain Guides Rails ---4 Timing Chain Sprockets (2 Secondary Exhaust, 1 Crank, 1 Idler) ---1 Water Pump ---1 Water Pump Gasket (Metal) ---1 O-Ring. 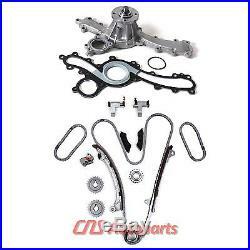 The item "For 03-12 Toyota Tacoma Tundra 4Runner 4.0L 1GRFE V6 Timing Chain Water Pump Kit" is in sale since Friday, January 2, 2015.